Getting to Know PC’s and the Windows 10 User Interface The first lesson of this course will identify the components of a personal computer. Students will learn how to sign into Windows 10, navigate the desktop, and explore the Start menu. Using Windows Store Apps and Navigation Features This lesson begins with how to multitask with apps, search your computer, and view notifications. 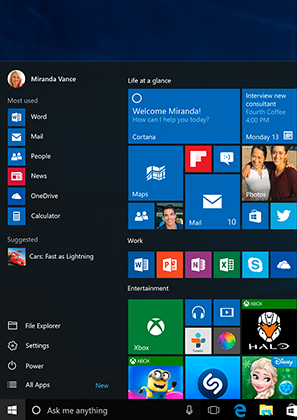 Then, students will learn about Windows Store apps and Windows 10 navigation techniques. Working with Desktop Applications Next, working with desktop windows, managing files and folders with File Explorer, and creating files with desktop applications will be covered. Using Microsoft Edge In this lesson, students will learn how to navigate the user interface of Microsoft Edge, the new default web browser. It also covers browsing the web, managing tabs, and modifying Microsoft Edge options. Customizing the Windows 10 Environment Students will learn how to change basic Windows settings, customize the Lock screen, and personalize the desktop. Using Windows 10 Security Features The final lesson will teach students how to configure passwords, use Windows Defender, and store and share files with OneDrive. Working with Windows 10 The first lesson of this course will teach students how to use the Settings window and the Control Panel, as well as how to work with virtual desktops and manage apps. Configuring User Accounts This lesson begins with information on how to configure user accounts using the Control Panel and the Settings window. Then we will take a look at how to use family safety features. Working with Apps in Windows 10 Next students will learn how to use key Windows 10 apps, including Mail, Calendar, Groove Music, Movies & TV, Camera, and Xbox. Working with Devices Students will learn how to connect devices to a PC and modify device settings in this lesson. How to manage devices and printers in the Control Panel will also be covered. Managing Networks In this lesson, students will learn about networks and how to manage them, as well as how to share files and folders with the Homegroup feature. Securing System Data Working with file history and data backups, recovering your PC, and configuring security settings will be covered in this lesson. Configuring System Settings In this final lesson, we will take a closer look at viewing system information, using the Task Manager, optimizing power consumption, and troubleshooting problems.